The Stratford Offroaders have organised another event in this series, with the HQ this time being at the Baden Powell Centre in Chipping Campden - Map Reference SP153/388. All proceeds from this event will go to The Children's Society. The Magellan Midlands Summer Series event start is from 09.00 to 10.30 with Registration between 08.30 and 10.15 and a duration of 4 hours. There is also a Standalone Non-competitive fun event for all the family with a start of 09.00 to 12.00 with Registration between 08.30 and 10.15 and a duration of 3 hours. Midland Trailquests was formed in 2006 by a group of enthusiastic organisers and riders and aims to foster the grass roots of the sport of Mountain Bike Orienteering in the English Midlands. 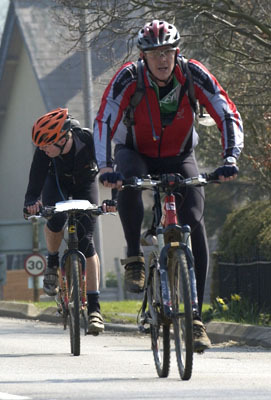 A Trailquest is a mountain bike orienteering event where the competitors have to navigate from control location to control location punching a score card at each location. Competitors may ride solo or as a team of two. Control locations vary in the amount of points they are worth and competitors may use any legal route to ride between them. The rider or team who scores the highest number of points within the time limit is the winner. To compete you must first register on-line with Midland Trailquests as it is a condition of their insurance policy that all riders are members. Registration is free and only takes a couple of minutes. "Dream Cotswold" - Drawings and Watercolours by F.L.Griggs R.A.